All transactions are safe and secure with a reliable history in online purchasing behind each of our associates. 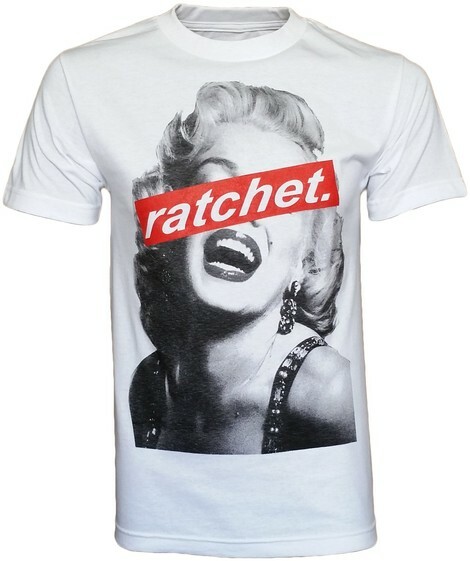 Buy the Marilyn Ratchet t-shirt to own Marilyn Monroe clothing and merchandise. A nice or naughty Marilyn shirt can be dress attire for an evening out or casual wear for a trip to the store. It says, "I'm very definitely a woman and I enjoy it." She followed the beat of her own drummer and it got her far. There are Marilyn dolls, posters, movies and books, but it is the unique clothing that celebrates her best. Young or old, no one can have too much of Ms. Monroe. Anyone who agrees should be sure to check out the Marilyn wig and white dress costume that are perfect for fans who just can't get enough. In addition to the Marilyn Ratchet tee above, browse the Marilyn Monroe Clothing Gallery for more apparel like men's and women's clothes, kids shirts or hoodies.